Somes compilation list Acorus gramineus and A. calamus as synonyms; others list them as separate species: (1) A. calamus Shui Chang Pu and (2) Acorus gramineus (syn. A. tatarinowii, Shi Chang Pu) containing the potentially toxic B-asarone. Lubigan is a common name shared by (1) Acorus calamus, and (2) Mapania humilis, Malalubigan. ARABIC: Vaj, Vash, Oudul vaj. FRENCH: Acore aromatique, Acore calame, Acore odorant, Acorus roseau, Belle angelique, Roseau odorant. HINDI: Bach, Ghorbach, Safed bach. ITALIAN: Acoro vero, Calamo, Canna odorifera. SANSKRIT: Bhuta nashini, Bhadra, Vacha, Vaca. SPANISH: Acoro, Cálamo aromático, Calamís. THAI: Hang khao pha (Chiang Mai), Som chuen, Wan nam, Wan nam lek. Lubigan is a perennial aromatic herb, with creeping, branching and rhizomatous rootstock. Rhizome are prostrate, firm and stout with compactly arranged annular rings with numerous rootlets. 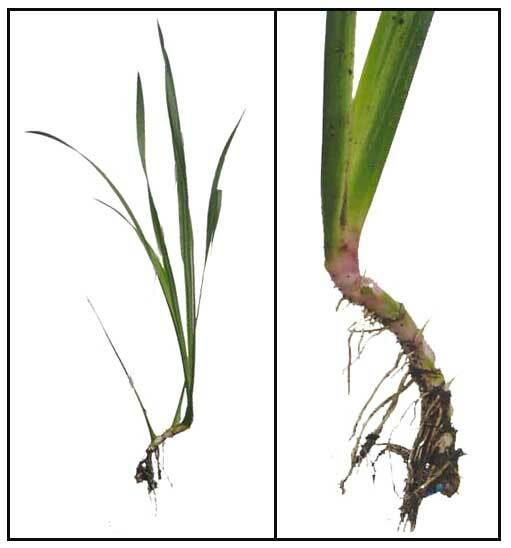 Leaves arising from rhizome are linear, distichous, 25 to 50 centimeters long, 1 to 1.5 centimeters wide, with waved margins and stout midribs, base of leaf sheathed, clasping to each other. Peduncle is compressed. Spathe is green, much elongated, similar in shape to the leaves. Spadix is 3 to 5 centimeters long, and 1 centimeter or less in diameter, and bears many flowers. Flowers are very small, compacted into a concave-shaped spadix inflorescence. Sepals are 6, stamens 6, rarely flowering in the Philippines. Fruits are berries, turbinate, prismatic, with pyramidal tops, about 0.2 centimeter diameter. - Along streams in mountains, creeks other moist places with running water, on boulders, etc., at low and medium altitude in Luzon (Laguna). - Also found in Bontoc and Benguet provinces in swamps, at an altitude of about 1,300 meters, as a naturalized element. - Also occurs in the temperate to subtemperate regions of Eurasia and the Americas. - Rhizomes contain a volative and aromatic oil, sugars, choline, mucliage, and a little tannin. - Phytochemical studies yield volatile oil (active constituents a-asarone and beta-asarone) and saponin. - Rhizome studies have yielded asaron, parasaron, asarylaldehyde, sesquiterpenes, acorin, eugenol. - An oily substance, calamol (C12H18)3) has been extracted from the rhizome. Calamol oil is colorless, mobile liquid, with a strong characteristic, and rather pleasant aromatic odor. The oil has been described as containing palmitic and heptoic acids, ester of palmitic together with some pinene, camphene, asaraldehyde, eugenol, asarone, calamene, calamerol and calameon. - Rhizome has yielded an alkaloid, mainly choline, soft resin, gum, starch, and a bitter glucoside, acorin. - Considered stimulant, carminative, emetic, antispasmodic, insectifuge, astringent. - Studies indicate anticonvulsant, antibacterial, antioxidant, insecticidal, radioprotective, glucosidase inhibitory, insulin sensitizing, antiepileptic, larvicidal, smooth muscle relaxant, neuroprotective, hypolipidemic, immunomodulatory properties. - Rhizome considered stimulant and tonic. - Oil of sweet flag considered antibacterial, antifungal, and antiamebic. Division of rhizomes and potted without drainage holes. For potting, use one part river sand, one part garden soil, one part coco coir dust and one part rice hull. When established, place in partial to full sun. · Best collected before flowering, the months of October and November. · Rinse, remove rootlets, cut into sections, sun-dry. May be stored fresh for a long time by keeping under moist sand. -Fresh rhizomes can be candied or used in cordial liqueurs, soups and sauces, mixed with other condiments (ginger, mace or cinnamon). -Young shoots used in salads, believed to improve the appetite. · Rheumatic arthritis, lumbago and leg pains: As embrocation, by cooking vine or rhizome (50 gms) with coconut oil (3 oz) . · Indigestion, gastritis; Used for ague, tonic dyspepsia. · Rhizome use as masticatory for toothache. · Rhizome used as stimulant and tonic. · Oil is carminative; also used as digestive and to increase the appetite. · Dried rhizome chewed ad libitum to relieve dyspepsia. · Oil used as expectorant and remedy for asthma. Also used for chronic dysentery. · Hakims use the rhizome for hemorrhages and intestinal ulcerations; also for suppression of urine and menstrual evacuations. · In Teheran, rhizome is reputed to be a remedy for rheumatism. · Rhizome is a nervine sedative; in large doses, nauseant and emetic. · Tinnitus, deafness, poor memory. · Loss of consciousness during high fever. · Sometimes combined with other drugs for treatment of insanity. · Decoction: 30 gms of dried material (roots and leaves) to a pint of boiling water; tea drunk 4x daily for dyspepsia, gastritis, indigestion, stomach pains, diarrhea, asthma. · Powdered rhizome used as insecticide and insectifuge. · Rhizome skin used as hemostatic. · Poultice of fresh material used for abscessed inflammation and scabies. · In Ayurveda, used for psychoneurosis, insomnia, hysteria, epilepsy, memory loss. Also, for cough, fever, bronchitis, depression, inflammation, tumors, general debility. · In Teheran, rhizome used as remedy for rheumatism. · In Chinese medicine, used to aid digestion and regulate gastrointestinal fermentation and acidity. In ancient Chinese medicine, used to relieve swelling and constipation. · In Greek-Arab medicine, used to treat gastritis, anorexia, epilepsy, rheumatoid arthritis. · Early Europeans, Chinese and Arbas considered it a strong aphrodisiac; while in North America and New Guinea, once used to induce abortion. Used to protect young children from bales or usog. The matured rhizome is round-peeled and dried and the pieces thread together and worn as a protective waist or wrist band. - Powdered rhizome used for sachet and toilet powders. - Oil used for scenting snuff. Also for flavoring alcoholic beverages. 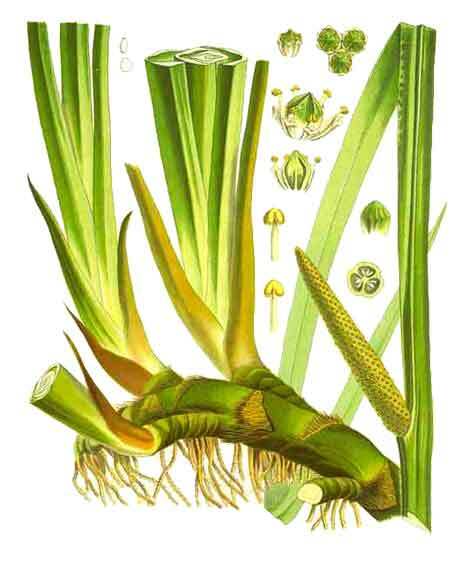 - Calamus oil also used in making perfumes. • Memory / Cerebral Atrophy / Alzheimer's Disease: Study in AD-induced rats treated with extract of volatile oil of A. gramineus and piracetam showed adjuvant therapy has the effect of controlling cerebral atrophy and prevention and cure of AD. • Pharmacognostical and Phytochemical Study: Microscopic studies showed the presence of epidermis, cortex, fibrovascular bundle, and starch grain the the drug powder. Phytochemical screening showed alkaloids carbohydrate, glycoside, phenolic compounds and tannins. • Antimicrobial: Study of rhizomes and leaf extracts showed pronounced antifungal activity with the ethyl acetate extracts. In addition, both a- and ß-asarones exhibited very strong antimicrobial activities against fungi and yeasts, higher than the rhizome and leaf extracts. Study suggests the active principles a- and ß-asarones might be responsible for the antimicrobial activity. Only antibacterial activity to E. coli was noted. - Cancer concerns: Banned from food products in some countries because of cancerous findings in animal studies, using high doses of carcinogenic ß-asarone, present in large amounts in Asian plants, but of limited amounts in European plants. Studies report limited amounts of the toxic derivatives in North American plants. - Putting the cancer concern in perspective, large doses are fed to test animals in elicit hepatic cancers. Other studies failed to show embryotoxicity or teratogenicity in the embryos of pregnant mice. These test doses are much larger than those found in herbal preparations. Alternativists argue its safety with its more than 2000 years of use by ancient cultures and folk medicinal practices. - Usually sold in the Quiapo herbal market. - Essential oil, seed, powder, leaf and rhizome extracts in the cybermarket. - Marketed in many herbal formulations. Inhibitory effects of the fragrance inhalation of essential oil from Acorus gramineus on central nervous system / Koo BS, Park KS et al / Biol Pharm Bull. 2003 Jul;26(7):978-82. Therapeutic Efficacy of Antihepatotoxic and Antioxidant Activities of Acorus calamus on acetaminophen-induced toxicity in rat / S Palani, S Raja et al / International Journ of Integrative Biology, 2009, Vol 7, No 1, 39. The effect of Acorus gramineus on the bioavailabilities and brain concentrations of ginsenosides Rg1, Re and Rb1 after oral administration of Kai-Xin-San preparations in rats / Wang W, Liao Q O et al / J Ethnopharmacol. 2010 Sep 15;131(2):313-20. Epub 2010 Jun 30. Sorting Calamus names / Maintained by: Michel H. Porcher, / MULTILINGUAL MULTISCRIPT PLANT NAME DATABASE / A Work in Progress / The University of Melbourne. Australia / Copyright © 1997 - 2000 The University of Melbourne. ANTIDIARRHOEAL ACTIVITY OF LEAVES OF ACORUS CALAMUS / M.D. Kapadia* and A.R. Kharat / Int J Pharm Sci Res 2012; Vol. 3(10): 3847-3850.